Chief Warrant Officer Five Robert J. Richardson assumed responsibility for the post of Command Chief Warrant Officer at a ceremony Feb. 7, at Joint Force Headquarters’ at Fort Dix. Richardson assumed the top warrant officer position in November 2008. 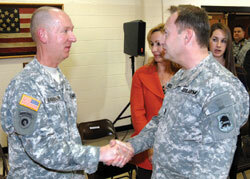 Richardson said his top priority will be to boost the ranks of the Warrant Officer corps. Richardson serves as the personal advisor to Maj. Gen. Glenn K. Rieth, the Adjutant General, on all matters related to the New Jersey Army National Guard Warrant Officer program. Chief Warrant Officer Five Robert J. Richardson (l) is congratulated by Chief Warrant Officer Three David B. Edwards (r) after the Change of Responsibility Ceremony on Feb.7. Richardson enlisted in 1968 and rose to staff sergeant before some friends suggested he look into the warrant officer program. “When I learned about it, I saw that being a warrant officer was a great career choice,” Richardson said. It’s a path he wants more NCOs to consider. Although 98 percent of the state’s aviation slots for warrant officers are filled, about 30 percent of the positions in the other specialties are vacant. “I’m going to try to solve this (shortage) by focusing more on those stand-out NCOs who would be a perfect fit for the program,” Richardson said. The passing of the New Year brought back familiar training to the New Jersey National Guard and the 50th Finance Battalion in Flemington. On the first drill weekend of the new year, the guardsmen of the state’s finance department put down their pencils and picked up light-sticks for the purpose of Civil Disturbance training. Instructed by Sgt. 1st Class Danny Colon and Sgt. Dewey Johnson, the eager soldiers of the finance battalion brought AR 500-50 to life. In a simulated riot, the leader bellowed out commands as the squad thunderously roared behind their four-foot shields. The light-sticks were not the only show of force. Every movement was carried out with a ground-shaking stomp and a disconcerting boot-drag. The rowdy mob had no doubts that the wedge formation was coming directly for them. With a grin plastered across his face, Colon loved every minute of it. The students had just as much fun as the instructors and Pfc. Santiana Marisol was a testament to this. Whether it is a domestic disturbance or missions across the pond, Marisol and the other soldiers are always prepared.